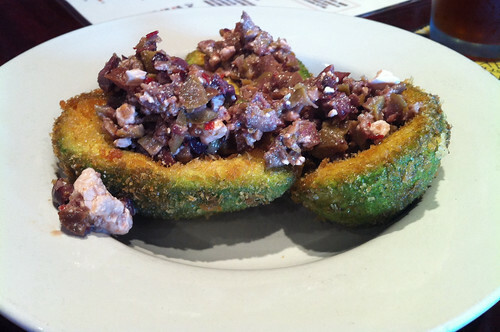 One of my favorite gastropubs, South of Beale, is downtown Memphis’ newest lunch option. After two years of being open nightly for dinner and drinking, owners Ed Cabigao and Brittany Whisenant started serving lunch about two weeks ago. The menu is similar to the evening menu, with a few changes – more sandwiches, soups and salads and lunch-friendly lower prices. I stopped by for lunch last week and tried the fish and chips ($10). The four medium-sized pieces of fish were very lightly breaded, which made the dish a little less heavy than I’ve seen at other restaurants. My picture makes it look like the fish and chips is just a big plate of fish, but I substituted the Cajun potatoes that normally come with the dish for a bowl of leek and Asiago mac’n’cheese. No matter what you’re having for lunch at South of Beale, I recommend getting it with a side of this mac’n’cheese. This is the sort of comfort food that your grandma wishes she could make. It’s a huge bowl of spiral noodles covered in a creamy, sharp Asiago cheese sauce. There are thin slices of cooked leeks mixed in, which adds a little bit of onion-y flavor. I also tried a bite of my lunch buddy’s fried avocado appetizer ($9). Though they’re billed as a starter, these olive and feta covered avocado halves are filling enough to be a meal. The batter is light, and the avocados are warm, but not to the point of total mushiness. 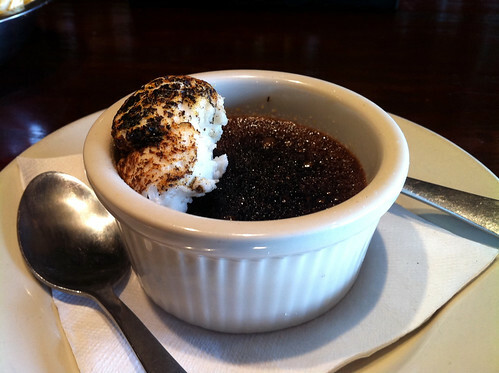 For dessert, I tried the chocolate creme brulee ($5), which comes with a thick, cumulus cloud of homemade marshmallow. When made with chocolate, creme brulee is a little more intense than normal. South of Beale’s version is thick and rich and has the slight bitterness of real dark chocolate. Share this one with a friend. South of Beale is open for lunch on week days at 11 a.m. They switch to their dinner menu around happy hour (4 p.m.). hope i find time for a visit im going to be in menfis 28 0ctober.